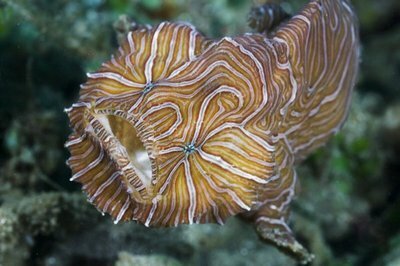 “Psychedelica” seems the perfect name for a species of fish that is a wild swirl of tan and peach zebra stripes and behaves in ways contrary to its brethren. So says University of Washington’s Ted Pietsch, who is the first to describe the new species in the scientific literature and thus the one to select the name. Psychedelica is perhaps even more apt given the cockamamie way the fish swim, some with so little control they look intoxicated and should be cited for DUI. Members of Histiophryne psychedelica, or H. psychedelica, don’t so much swim as hop. Each time they strike the seafloor they use their fins to push off and they expel water from tiny gill openings on their sides to jet themselves forward. With tails curled tightly to one side –which surely limits their ability to steer — they look like inflated rubber balls bouncing hither and thither. While other frogfish and similar species are known to jet themselves up off the bottom before they begin swimming, none have been observed hopping. It’s just one of the behaviors of H. psychedelica never observed in any other fish, says Pietsch, UW professor of aquatic and fishery sciences and curator of fishes at the UW Burke Museum of Natural History and Culture. He’s the lead author of a paper about the new species that’s now online at Copeia, the journal of the American Society of Ichthyologists and Herpetologists. 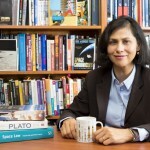 His work is funded by the National Science Foundation. It was little more than a year ago that the fish with rare, forward-facing eyes like humans and a secretive nature was the subject of worldwide news coverage after having been observed in the busy harbor of Ambon Island, Indonesia. An adult fish was observed in January 2008 by Toby Fadirsyair, a guide, and Buck and Fitrie Randolph, two of the co-owners of Maluku Divers, which is based in Ambon. They and co-owners Andy and Kerry Shorten eventually found Pietsch to help them identify the fish. Since the first sighting divers have observed a number of adults and juveniles, now that they know what to look for. 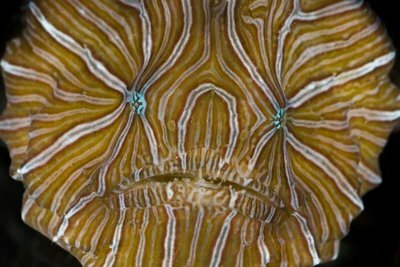 Adults of H. psychedelica are fist-sized with gelatinous bodies covered with thick folds of skin that protect them from sharp-edged corals as they haunt tiny nooks and crannies of the harbor reef. 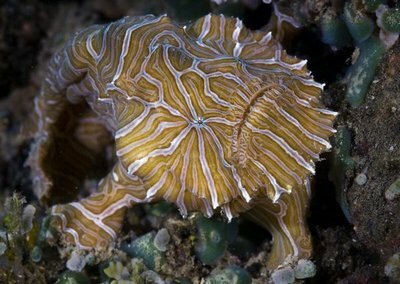 Fins on either side of their bodies have, as with other frogfish, evolved to be leg-like, and members of H. psychedelica actually prefer crawling to swimming. The species has a flattened face with eyes directed forward. It’s something Pietsch, with 40 years of experience studying and classifying fishes, has never seen before in frogfish. It causes him to speculate that the species may have binocular vision, that is, vision that overlaps in front, like it does in humans. Most fish, with eyes on either side of their head, don’t have vision that overlaps; instead they see different things with each eye. DNA work revealed that H. psychedelica joins two other species in the genus Histiophryne, though the other two are very drably colored in comparison. The genus is but one of about a dozen in the family Antennariidae, known as frogfish in most places in the world. The frogfish are, in turn, part of the larger order of Lophiiformes, or anglerfish. Pietsch is the world’s foremost anglerfish authority and, when sent a photo last year of the newfound fish, he said he’d stake his reputation that it was an anglerfish. He was right. But what an unusual member it turned out to be. Compared to other anglerfish, members of H. psychedelica have no lures. Most anglerfish have lures growing out of their foreheads. The other anglerfish sit right out in the open on the seafloor or coral reefs, often adapting their coloring so their bodies are camouflaged, but the lures are meant to be noticed so the fish wave, wiggle and sometimes blink the lures on and off in order to attract pray, Pietsch says. Instead of all that showiness, members of H. psychedelica are shy and secretive, probably one of the reasons they weren’t previously spotted. When a member of H. psychedelica is uncovered by divers it usually seeks a new place to hide within 10 or 15 minutes. 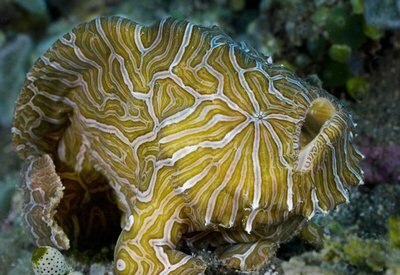 The coloring led co-author David Hall, a wildlife photographer and owner of seaphotos.com, to speculate that the fish is mimicking corals. Indeed, Hall produced photos for the new scientific paper showing corals the animals may be mimicking. The scientists found, however, that the vivid colors faded in a matter of days once a specimen was preserved in ethanol. The flesh of the preserved specimen looks white, but with a microscope one can still see the striping, Pietsch discovered. This got him thinking about two specimens sent to him in 1992 that he’d kept as part of the UW’s fish collection. The Dallas Aquarium had sent him two frogfish, found in a shipment of live fishes from Bali that they said had unusual pigment patterns. The staff had nicknamed them “paisley frogfish.” But the photograph Pietsch was sent was of poor quality and the preserved specimens Pietsch received were white, so he didn’t give them much thought. Pietsch retrieved the old specimens from the collection, put them under a microscope and found the striping distinctive to H. psychedelica. He’d had two specimen of a new species of fish for 17 years, but didn’t know it. Note restricting use of images: Magazines with circulation greater than 250,000 may not use still images by David Hall without first contacting him at david@seaphotos.com. Photo credit required.